Pieces of French history are on display for the first time in over 200 years, and if you have a few hundred thousand dollars that you’re looking to spend you can own some of it, too. Jewelry from infamously luxurious — and final— French monarch Marie Antoinette’s flashy collection is set to be auctioned off by Sotheby’s on Nov. 12 in Geneva, Switzerland as part of the Royal Jewels from the Bourbon-Parma family sale. The personal collection features a natural pearl and diamond pendant, a diamond brooch, and a couple of pearl necklaces. Each piece of jewelry is estimated to pull in anywhere from $20,000 to $2 million dollars. “I think she probably was one of the original, you know, the original ‘it girl’. Honestly, in terms of her style and her relationship to fashion and jewelry,” Frank Everett, vice president and sales director for Sotheby’s jewelry, reported. Wikimedia CommonsA portrait of a young Marie Antoinette, circa 1767-1768. Marie Antoinette was the last Queen of France before the revolution and was known for her extravagant style and taste in jewelry. Born in Vienna, Austria in 1755 to the Holy Roman Emperor Francis I and the Habsburg Empress Maria Theresa, Marie Antoinette became a part of French royalty when she married the future King Louis XVI before she had even turned 16-years-old. She thrived in a royal lifestyle. She and her husband notoriously enjoyed the finer things in life and as a result, became the subject of brutal gossip by their constituents. It was already an unsettling time for European monarchs and the public thrust the blame for much of their problems onto the king and queen. During the inevitable French revolution, Marie Antoinette’s luxurious lifestyle came crashing down. She and her family were forced to live under the watchful eye of revolutionary authorities and later planned an escape out of France. Unfortunately, all of the royal family never made it out. King Louis XVI and Marie Antoinette were arrested in 1791 before they could flee and were executed by a guillotine in Oct. 1793. However, before her arrest, Marie Antoinette was able to safely smuggle her jewelry collection out of France. Laura Ly/CNNPart of the collection Royal Jewels from the Bourbon Parma Family, which is headlined by Marie Antoinette’s jewelry, up for sale by Sotheby’s. Just before she was arrested, Marie Antoinette carefully wrapped her exquisite gems and jewelry in cotton and placed them inside a wooden box. “This is how she spent her last night of freedom, it was caring for these jewels,” Everett continued. Indeed, according to an account from the last Queen’s handmaid, she spent an entire evening packing her jewels. The wooden box then journeyed to Vienna by way of Brussels where it was placed in the helping hands of Florimond Claude, Comte de Mercy Argenteau, an Austrian diplomat and loyal friend of the queen. During the revolution, Marie Antoinette and King Louis XVI’s two children were also captured. Their young son died at the age of 10 shortly after he was seized, but their daughter, Marie-Thérèse, survived three years of solitary confinement and was released in 1795. Marie-Thérèse, the last surviving child of the French monarchy, made her way to Vienna and reclaimed her mother’s jewelry collection from Florimond. The jewelry stayed within the family of Marie Antoinette’s heirs for more than 200 years and this is the first time that the jewels have been put on display for the public to see. Sotheby’sOne of Marie Antoinette’s natural pearl and diamond pendants. “What is also striking is the inherent beauty of the pieces themselves: the precious gems they are adorned with and the exceptional craftsmanship they display are stunning in their own right,” she added. 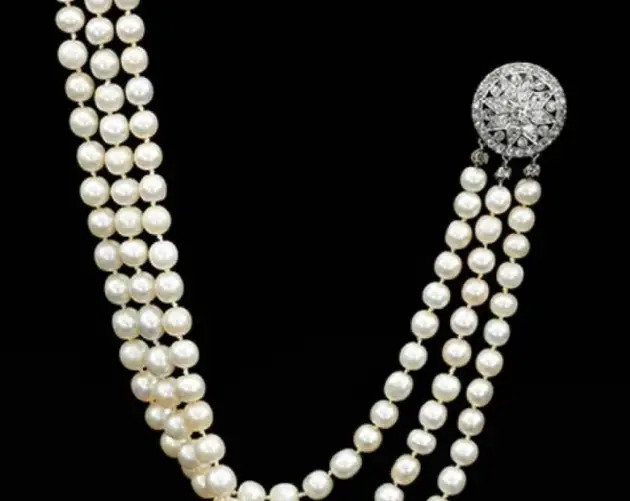 The prices that Sotheby’s estimates that Marie Antoinette’s jewelry will sell for are lofty, but they could potentially soar sky-high once auction day rolls around. Sotheby’sA ruby and diamond brooch/hair ornament that was given to Marie Anne de Habsbourg-Lorraine, the archduchess of Austria, by Archduke Friedrich of Austria. The collection of jewelry on sale belongs to the Bourbon-Parma family, whose bloodline is linked to some of the most important ruling families in European history, including the Habsburgs, who ruled the Austro-Hungarian Empire until 1918. According to Sotheby’s, the Bourbon-Parma family has produced Kings of Spain and France as well as Emperors of Austria. Marie Antoinette’s life may not have come to a happy ending, but her gorgeous jewelry collection has helped the beauty of her life stay alive for centuries and will continue to do so through this sale. Next, take a look at the life of another European queen who lost her head, Mary, Queen of Scots. Then, discover how generations of inbreeding in one of Europe’s most powerful royal families created a phenomenon called the Habsburg jaw.